As some readers may know, business and human rights, and forced labor and human trafficking are a big area of focus for us at Innovation Forum. I recall first hosting a conference on this topic in 2003, and much has changed since, at least in terms of awareness. Looking at that 2003 agenda, here you can see many of the issues are the same. Similarly with the 2004 version, here. What’s changed? Business awareness in many more sectors, commitments and there’s more focused action on the most difficult areas, such as forced labor and human trafficking. There’s also a lot more gender balance in our events these days, and not before time! Our most recent conference on this subject was in Washington, D.C. last month. And in this blog post, I want to share with blog readers some of the key points from the conference. This isn’t all of them (the notes we produce are much more comprehensive, and all points are anonymous). These are only published on this blog, usually only conference attendees get them, and I hope you find some of the points useful. All are ‘crowd sourced’ from our our speakers and high level business and NGO and Government attendees. 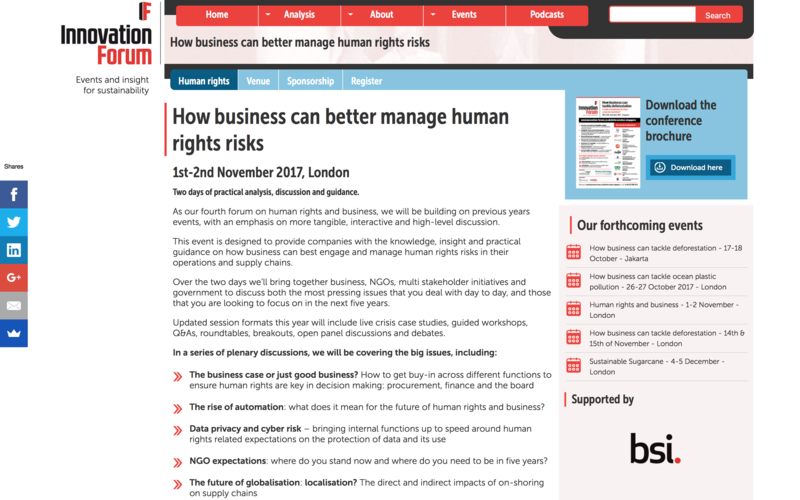 Oh, before we get into that, you may want to take a look at our next conference in this area: Human rights and business – 1-2 November – London which promises to be an excellent two day conference. Much more dynamic and interactive than those from back in 2003 and 2004, and with a much better gender balance! The World Bank estimates that 60% of the global population lives outside the protection of the law. So there are large parts of the world where there are laws without enforcement. Migrant labor has become big business – data suggests there are 150 million migrant workers, and it typically costs $1,500 to move each one from home to place of employment. Too many business models have been built around the workers paying that cost. When workers end up paying $1000s for their job, they end up having effectively to work for free to pay the money back. Or mortgage family farms or borrow from loan sharks. It can take years before loans are paid back (if ever). o demonstrate to companies that if they’re not paying fees for international migrant workers then the chances are the workers are paying them. So how should business respond? Engagement with local communities is essential, particularly in the extractives sector, but is also resource-intensive and requires specific expertise. Taking industry-wide approaches in certain areas can save time and resources – for example as part of the Consumer Goods Forum, or through training materials that can be freely shared with all peer companies across sectors. Companies in all sectors are still working to better integrate sustainability concerns into their procurement function. Good training materials are essential in this effort and are actively being developed by many companies and service providers. When tackling challenges in supply chains, it’s vital to assess which actors have the leverage needed to effect change upstream. Tier one suppliers that service an entire sector may have significant leverage to effect change – more, for example, than their individual customers. Benchmarking is the best way to get companies to improve behavior. It is a key tool for assessing progress. How can companies help other actors drive change? Companies can help NGOs by supporting strategic litigation in places where the letter of the law is not upheld. NGOs are targeting holding business to account by backing court actions in jurisdictions where convictions can be made. Strategic journalism and story telling has its place to play – such as the coverage of the Thai seafood supply chains, where forced labor is endemic. This is attracting the attention of the investment community. Investors are engaging companies – and are becoming more aware of their potential influence as shareholders to hold company leadership to account. Encouraging/insisting on the ability of workers to have collective bargaining and freedom of association is a crucial step. Organized workers can cooperate to make sure that slavery/forced labor doesn’t happen. But taking a pro-union stand requires a change of mentality for many companies. The unionization of fishing workers in Taiwan is an example of what can be achieved. How do we engage the supply chain effectively? Some businesses have given the impression that they will never take action unless there is actual or risk of media exposure of slavery in their operations or supply chains. Supply chain mapping can be a key tool to help companies identify where their slavery/labor risks are. Data analysis can help link labor and human rights risks with particular goods/services. A good approach can be to deep dive with one tier 1 supplier into tiers 2 and 3. Approaching an entire supply chain is very daunting so, when starting out mapping for labor and modern slavery risks, choose mature suppliers where there is a good and long-established working relationship and work from there. There is an argument that companies get too hung up on engaging with lower tiers – focus on developing better relationships with their own direct suppliers is a better first approach. While strong policies are important, when setting targets or corporate ambitions, take care not to be setting precedents that create a duty for the company to have to act in a particular way. If you say you are doing something then you need to do it. Use the same investigative and due diligence techniques for supply chain labor risks as for any other legal risks. There’s lots more in the notes, but I can’t publish all of them here. For more, come along to our event in November in London. Two days of practical analysis, discussion and guidance. As our fourth forum on human rights and business, we will be building on previous years events, with an emphasis on more tangible, interactive and high-level discussion. This event is designed to provide companies with the knowledge, insight and practical guidance on how business can best engage and manage human rights risks in their operations and supply chains. Over the two days we’ll bring together business, NGOs, multi stakeholder initiatives and government to discuss both the most pressing issues that you deal with day to day, and those that you are looking to focus on in the next five years. Updated session formats this year will include live crisis case studies, guided workshops, Q&As, roundtables, breakouts, open panel discussions and debates. Senior representatives committed to coming include those from: Global Witness, Vodafone, White Stuff, Kingfisher, Standard Life Investments, Idox Germany GmbH, Twinings, Unseen, International Tourism Partnership, Bonsucro and many more. Beth Holzman, Good World Solutions, and Dan Viederman, Humanity United, talk to Ian Welsh about the new West Principles for worker engagement on forced labor. Companies don’t know what is going on in their supply chains on human rights and forced labor, and social audits have proved to be inadequate. The Worker Engagement Supported by Technology (West) Principles are a set of guidelines for technology- driven efforts to engage workers in global supply chains. Technology has the capacity to scale worker engagement and data collection, and to help business better understanding migration patterns. The eight principles fall into four distinct stages: design, engage, analyze and utilize data. They aim to maximize the impact of technology-driven efforts to engage workers in global supply chains and ensure they can work with dignity and free from abuse. Initiated by a group of technology providers, the principles seek to engage stakeholders at all levels of global supply chains – including workers, worker organizations, the private sector, and governments – to collectively develop a roadmap to operationally their use. Rob Lederer, executive director, Electronic Industry Citizenship Coalition talks with Innovation Forum’s Ian Welsh about EICC’s new Responsible Labor Initiative. The new initiative is designed to facilitate cross-sector collaboration, exporting EICC’s due diligence tools to other industries. Lederer points out that forced labor issues are not unique to the electronics sector and, as such, there is much that other sectors can benefit from the electronic sector’s work. He admits that many were caught off guard by the issues of modern slavery and forced labor – and explains how EICC has worked hard to move from a reactive to proactive approach to the challenges. With the prospect of the repeal of the Dodd-Frank legislation in the US, the imperative for industry to stay on top of these issues is more important now than ever.